In the last post, we explored What is Ayurveda and What Can it Treat? Nasya is a simple, yet effective Ayurvedic therapy involving steam inhalation, facial massage and nasal application of herbal oil - customized to the individual. The nasal passage is very delicate with membranes that require lubrication to stay healthy, especially in drier climates. When you are exposed to cold, dry air in fall or winter, or even dust and air conditioning in the summer, the nasal passage requires care. With Nasya treatment, warm herbal oil lubricates the nasal passages and removes obstructions to allow smooth breathing and smooth flow of prana or qi. The nose is also considered as a passage to the brain - nasya treatment is also very effective for conditions related to the brain & nervous system. It is recommended as preventative care for individuals prone to allergies, respiratory or sinus infections, or anyone exposed to dry, cold or windy climates. It can help remove excess mucous from the sinuses and drain toxins. What are the Benefits of Nasya? How is Nasya Different from Neti Pot? Both therapies help cleanse and drain the nasal passage and sinuses. Neti can be done on your own and involves warm saline water flushed through the nostrils. It was traditionally incorporated into preparation for yogic practices. Nasya involves herbal oil and is applied after steam inhalation therapy and facial massage to stimulate circulation and loosen excess "kapha" or mucous in the face. This was traditionally used as a method to allow medicinal oils to be absorbed locally in the body. Nasya is best done preventatively, and is often suggested in a series of treatments in close succession for maximum benefit. The treatment is customized according to your constitution and health concerns. Nasya treatments are half an hour in duration. 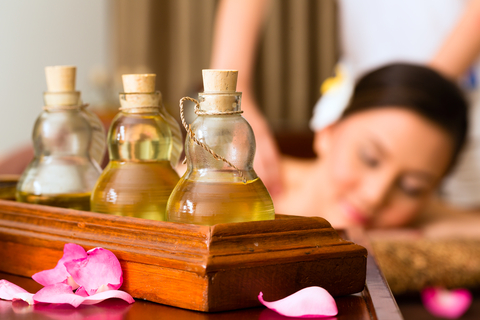 A series of daily or weekly treatments may be recommended for best results. Fall is an excellent time to experience Nasya and prevent colds & flus. Speak to your Ayurvedic practitioner to find out which therapy is best for you. What is Ayurveda & What Can it Treat?